There is a brand new Superdrug in Glasgow and of course the minute it opened I had to get along and take a good snoop about. handily placed in the West End retail park on the Crow Road this little beauty has parking right outside- pretty nifty for your last minute needs. 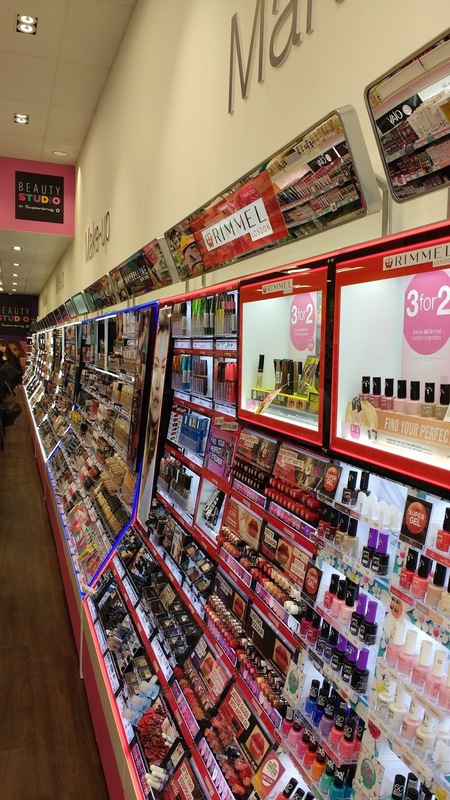 Housing what you have come to expect in a good Superdrug branch, there is a brow bar and really well stocked perfume counter as well as an AMAZING wall of make up brands, it is a proper one stop shop. I am always so excited to see properly stocked shelves of all my favourite brands, and I am of course obsessed by collecting my points on purchases too. While there I picked up a refill of a few of my most used products right now and thought it was an ideal time to share. The First one is the Simply Pure Hydrating serum that my best pal Mairead first passed on to me to try and I absolutely love it. Since then I have seen it raved about in so many places ( including a big fan in Sali Hughes), and is often compared to really high end products which is amazing considering it costs the princely sum of £2.69 and often on offer. This might look pretty inconspicuous but it is a lovely light formula that properly hydrates my skin and leaves it soft and nourished looking. I use it every morning underneath the moisturiser and I can really tell when I haven't used it. Being from the Simply Pure range it is fragrance free and totally suitable for all skin types as it is incredibly gentle. I actually laughed checking out the reviews for this on the Superdrug page while linking to it- so many simply beg PLEASE PLEASE NEVER DISCONTINUE. Now if that doesn't tell you how much people love it, I don't know what will! For less than a price of a sandwich, this is completely worth anyone trying. Next up is the newest to my routine as I needed a new moisturiser with a light SPF for the end of winter. I had found success in other of the optimum range including the product below so it felt a natural place to look for something different. I settled on the Birch Water Day Cream with SPF 15 and for the time of year i needed it, it has performed just fab. The optimum range has loads of products with some excellent ingredients and usually has strong offers on ( currently £8.99 for this one) I have found it pairs wonderfully with the serum as it is similarly lightweight and hydrating and it sinks in super fast which means make up application is a breeze. I was delighted it was non greasy and without being rich it was still a good amount of hydration for my still winter burned skin. 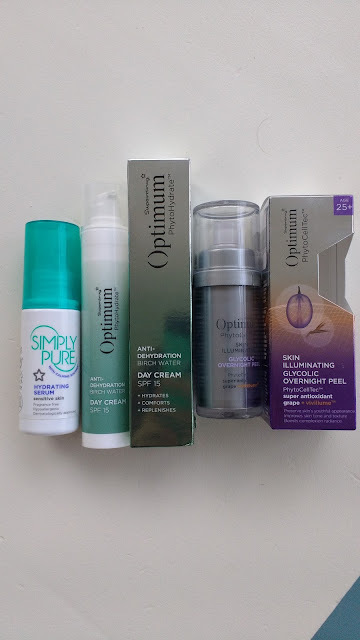 The first Optimum range product I had ever tried was the Optimum Grape Overnight peel, that I had again picked up after hearing loads about it in beauty forums. This wee beauty has a gel texture that is very light and not super sticky to apply and is a glycolic product which is my ingredient of choice for my skin type. Stacked also with Anti oxidants it is no wonder it was a winner at the Anti Ageing beauty awards, you leave this on overnight and it gently exfoliates and leaves my skin feeling and looking really fresh in the AM. I use it 2 or 3 times a week and can always see the difference on those mornings, it just makes me look much brighter as my skin leaves very dull looking!Again I usually purchase when on offer which makes it really reasonable in comparison to a lot of my glycolic products. I hadn't even realised how many of these products had actually settled into my routine in the last few months, I am totally keen on trying a few more too- I love affordable skincare options!! 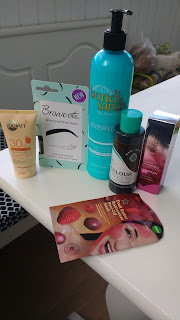 I have a wee bundle of other Superdrug highlights sitting ready to pamper with in the next few weeks, so I will update on how they go. If you are in Glasgow I would totally make use of the new store, and check out a few of the above and see what you think.